The good news is that these cookies don’t need a lot of fluffy filler descriptions. They were almost life changing for me. I thought I didn’t like butterscotch. But I do. Even more so when paired with chocolate and pecans in the perfect chocolate chip cookie The outside of the cookie has almost a crisp shell and the inside is chewy and delicious. 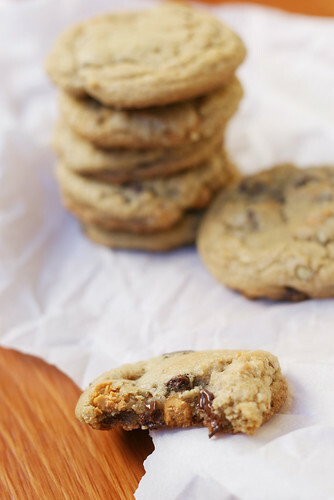 Every bite with a butterscotch chip is like biting into cookie dough concentrate. So try these. TODAY!! In a medium sized bowl, whisk together the flour, baking soda, and kosher salt. Set aside. In the bowl of a standing mixer, beat together the butter and sugars until light and fluffy. Add the vanilla and egg and beat again for about 30 seconds. Turn the mixer down to a low speed and slowly add the flour, mix just until incorporated. Add the butterscotch chips, chocolate chips, and pecans and stir to combine. Using a medium cookie scoop (or rolling 2 tablespoons into a ball), place the dough 2 inches apart on the baking sheet. Bake for 9-11 minutes. No more than 11 minutes! The edges should have just a touch of golden brown and the tops should not look wet, but they should still feel soft to the touch. >You crazymofo!! Just kidding, these cookies don't need any extra fluff. Mmmm, and I love that you textured the parchment paper. You go with your badass food styling skills. Good luck tomorrow, and I know everything that your turkey feast will be EPIC!!! >You are amazing and kind of insane! but the plus side is that you'll have an entire Thanksgiving feast to post BEFORE thanksgiving, which is the food blogger ideal, right? Instead of the rest of us (cough me) who will have no idea what they're cooking until Thanksgiving morning and thus will have no "here's what you should make for Thanksgiving!" posts. I want these cookies. In my belly. So bad. >These look amazing! I can't wait to find an excuse to make them! You will rock Thanksgiving, I can't wait to see how it turns out. >looks so delish and choclatey! love the simple narration and all the flavours that hv gone into it…a must try! 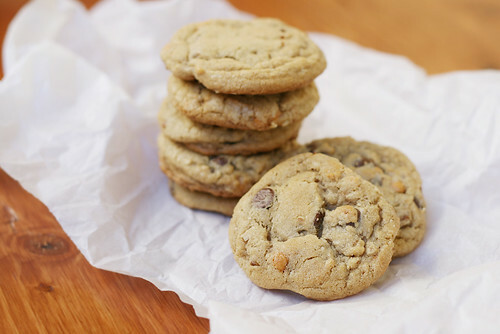 >I was craving cookies EXACTLY like this… without even realizing this is what I was looking for. Genius. It has the chocolate… the butterscotch.. the texture from the pecans. Perfect. Can't wait to try them. Also, good luck in China! Can't wait to read about your adventures.